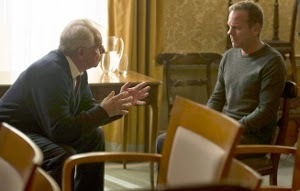 The fifth hour of 24: Live Another Day is a serviceable plot-forwarding episode that keeps Jack Bauer (Kiefer Sutherland) mostly on the sidelines. Spoilers follow in this brief discussion. CIA op Kate Morgan (Yvonne Strahovski) steps up more than ever to fulfill her unofficial designation as the “female Jack,” always a step ahead of her colleagues and superiors. Chloe O’Brian (Mary Lynn Rajskub) works with the partner we now know is her boyfriend, hacker extraordinaire Adrian Cross (Michael Wincott), to corroborate Jack’s assertions that Margot Al-Harazi (Michelle Fairley) was in fact behind the season-opening drone attack. Though solidly-paced, this episode was the season’s first to feel a bit perfunctory. A few inevitable meetings occurred. Jack reunited with former flame Audrey (Kim Raver) and met face-to-face with her father, President Heller (William Devane). Essentially in captivity, Jack is allowed some nuanced moments. His brief catching-up chat with Audrey was sensitively handled, a moment tenderly played by both Sutherland and Raver. Despite his problematic dementia, Heller seems in full mental command upon learning that Chief of Staff (and Audrey’s husband) Mark (Tate Donovan) failed to inform him of civilian deaths incurred during the drone strike that claimed Margot’s husband (fueling her revenge-driven plan). It’s probably for the best that the writers don’t cram the dementia angle down our throats every episode. Mark continues to reveal himself as a wishy-washy liability. Continuing to steal the show is Michelle Fairley as the nuttier-than-a-Payday Margot. Last week she cut off her daughter Simone’s (Emily Berrington) finger to convince son-in-law Naveed (Sacha Dhawan) to overcome second thoughts about piloting hijacked drones. Fairley is cold as ice, totally believable as the villainess. Berrington excels in portraying Simone as an utterly lost woman, standing by as her mother guns down her husband. Now widowed, Simone remains inexplicably loyal to her mom. The series’ biggest piece of deadweight thus far, CIA honcho Steve Navarro (Benjamin Bratt), finally does more than stand around telling Kate that she’s been pulled from the case. Believing they have a lock on the location of an IP address from which Margot’s video was sent, Navarro leads a team to raid the house. It turns out to be a trap set by Margo, therefore a dangerously stupid decision by Navarro to jeopardize his safety. Between Jack, Kate, and Chloe we would probably wrap this whole thing up quickly, but that wouldn’t be as much fun as having various characters make ill-considered decisions while refusing to believe the people who really understand what’s going on. 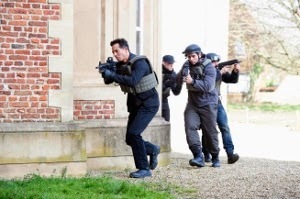 24: Live Another Day airs Mondays on Fox at 9/8c. If you missed this week’s episode, catch up for free at the official Fox site.